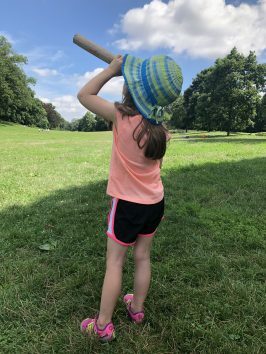 Each week of SummerCamp, KinderHaus offers designated weekly themes in both the WaldKinder program (ages 3 and up) as well as the SommerKinder program (ages 2 and up). All campers engage in fun and educational projects and go on excursions. The SummerCamp daily schedule revolves around group projects which have a multidisciplinary focus on arts, cooking, math and science, language and movement. To register, kindly fill in the online application. Please click here for more details about tuition, facilities and themes for each week. The cornerstone of the Forest Kindergarten approach is teaching environmental and natural science principles in the field. Its objective is to forge an intimate, deep and personal connection to the natural world. The many positive effects of outdoor education on children’s development is brought to life in the WaldKinder camp at KinderHaus. 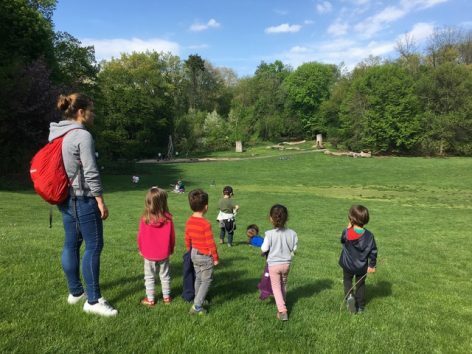 Instead of the classroom, children will spend the day in Prospect Park and follow the lead of our Waldorf-trained KinderHaus teachers, who will transform the park into a classroom with forest inspired arts and crafts. The WaldKinder will learn through experiments and sensory activities and other theme related curricular activities. Children will engage in forest related projects and games that strengthen their respect for nature and which make use of outdoor materials to develop a deeper sensibility for nature as a living environment. For example, they will build their own shelter in form of a “Laubhütte” as well as benches, tables and a mud pie kitchen using materials only found in the forest. The children’s imagination will be unleashed and guided toward refining their skills in all developmental domains. 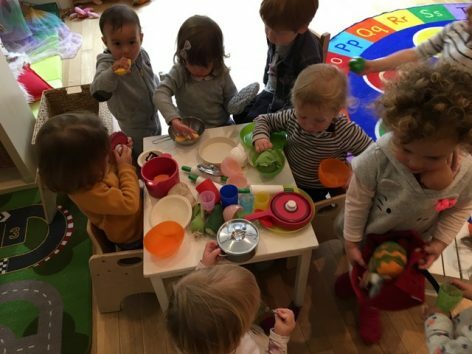 The children engage in workshops that follow the KinderHaus inquiry-based philosophy where problems and questions are posed before children start the investigation and exploration. As they make their way through the different areas of the park, campers will also focus on the birds, insects and other animals which live in the park and learn about nature’s life cycles. Projects will originate from questions such as: How does a solar clock work? How do ants live? Why do certain plants grow in certain places only? How do we create energy with wind and water? 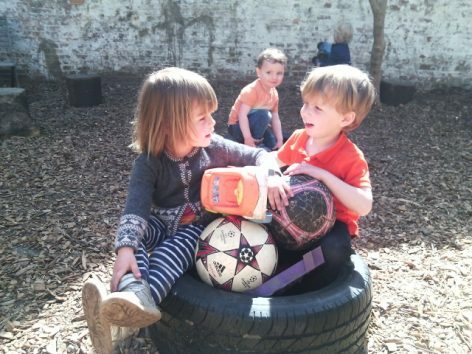 Furthermore, a variety of group and trust binding activities will support the children’s friendships and close bonds with each other. 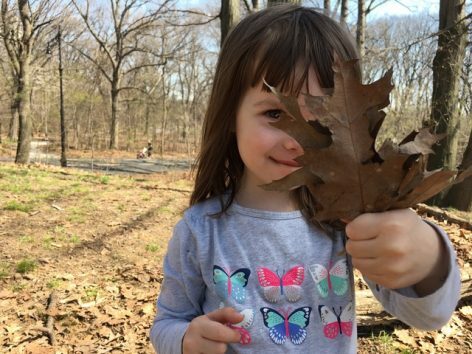 To learn more about the pedagogical focus of a Forest Classroom, please feel free to take a look at the articles for how outdoor play helps develop children’s cognitive and social development. 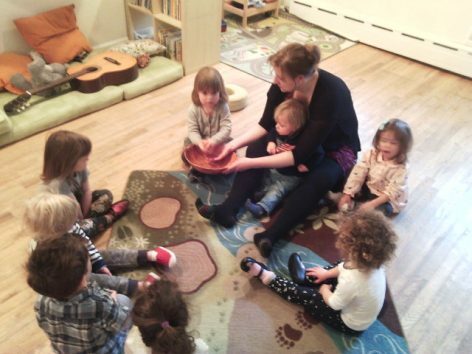 The ‘SommerKinder’ program is filled with daily hands-on exploration with a changing weekly focus indoors and outdoors. The weekly themes will guide children’s daily sensory, creative and problem-solving activities relating them to knowledge of water science, building and constructions, arts and music and yoga. 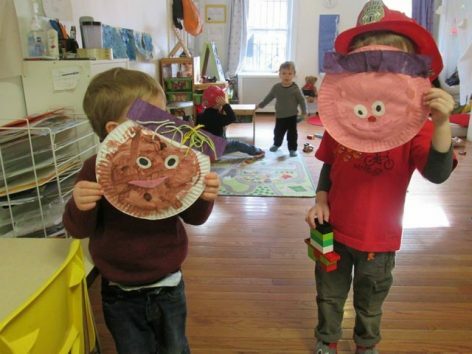 The children will experiment with different elements, they will think critically about ways to use recyclable materials, they will discover and learn about animals in the park, and they will get messy while enjoying art projects and gardening with their hands and feet. In order to nurture children’s love for music, movement, dance, and stories, we will express our imagination and creativity during music and theater performances. The SommerKinder will try out various roles, using their body language, voice and dancing skills. 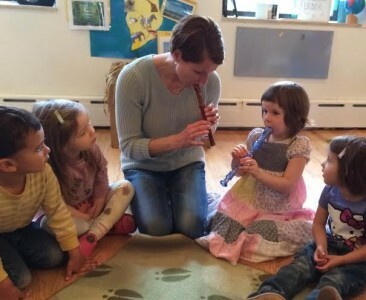 The interpretation of stories using different musical instruments will help identify and express their own emotions and recreate the atmosphere. As natural architects and builders, children will enjoy a marvelous creative experience working with a variety of building material indoors and outdoors. In our Earthwork Workshop, for instance, we will engage in activities that will teach us how to make use of the natural materials around us and how to be creative with them. Children will be introduced to land art and create their own; they will reflect on aesthetics and engage in land art games. They will experience all aspects of the process and work together in collaborative group projects. 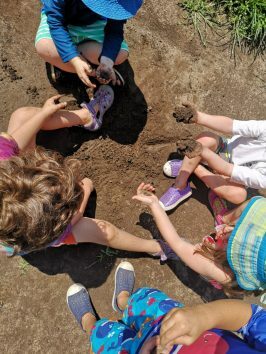 SommerKinder will conduct experiments with water, air and soil, and they will think about ways to save water and learn about global water resources and usage. In a combination of arts and science activities, children will use a variety of techniques to paint and create pictures with water color, mix paint and enjoy the sensory experience of painting with their hands and feet. 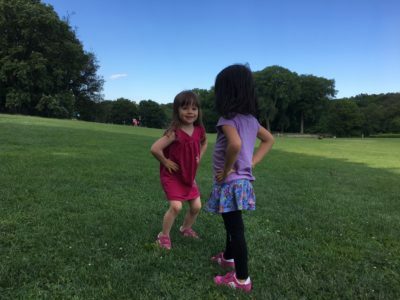 The popular KinderHaus MiniCamps are a great way to experience the fun-filled and exciting KinderHaus program, make new friends and fully immerse in the German language and culture for a day, a week or in addition to the regular DaySchool program.